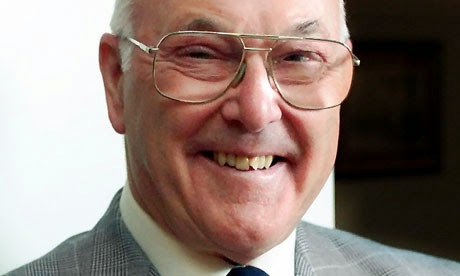 Graeme Murray Walker, OBE (born 10 October 1923) is a semi-retired Formula One (F1) motorsport commentator and journalist. For most of his career he worked for the BBC, but when it lost the contract for F1 coverage to ITV, Murray continued his commentating after the change of broadcaster. He has a distinctive, enthusiastic commentary style. Since 1978, British television commentary of the Formula 1 seasons has been used by other broadcasters right around the world, including Australia and Japan. He was an exponent of the commentator's curse, noting in an interview that he might say how well a driver was racing or that they would probably win the race, only to have them retire or crash out of the race shortly thereafter, hence his catchphrase "...Unless I'm very much mistaken..." which might lead shortly after to a correction "...And I am very much mistaken...". He is known for his gentlemanly and considerate conduct, seeing the best in drivers who had attracted controversy. He rarely criticised drivers and preferred to give the benefit of the doubt in attributing blame for incidents. One example of this was during the 1994 Australian Grand Prix where, following the controversial crash between Michael Schumacher and Walker's close friend Damon Hill which decided the World Drivers' Championship in the German's favour, Murray, unlike his fellow commentators at the time, most notably former 500cc Motorcycle World Champion Barry Sheene, declined to blame Schumacher outright for the crash. Murray was born in Hall Green, Birmingham, Warwickshire. His father Graham was a despatch rider and works motorcyclist for Norton Motorcycle Company, who participated in the Isle of Man TT and was Sales competition Director at the Rudge-Whitworth Motorcycle company. He attended Highgate School and in World War II he graduated from the Royal Military Academy Sandhurst and was commissioned into the Royal Scots Greys. He went on to command a Sherman Tank and participate in the Battle of the Reichswald with the 4th Armoured Brigade. He left the army having attained the rank of captain and then worked in advertising for Dunlop and Aspro. He was then employed by the Masius advertising agency, with clients including Mars, Vauxhall Motors and British Rail. He did not retire from this until the age of 59, long after he was famed as a commentator. He also briefly competed in motorcycle races himself. Murray is often wrongly attributed with having invented the famous slogan "A Mars a day helps you work rest and play": "[it] was something that I administered, but I never invented it. I'll tell you how it got ascribed to me. It got put into an obituary file, maybe all of my obituary files, and I can't get rid of it. It's amazing the way it sticks." He did, however, create the slogan "Trill makes budgies bounce with health" - a famous advertising slogan for bird seed in the 1960s as well as the slogan "Opal Fruits, made to make your mouth water." Murray made his first broadcast at Shelsley Walsh hillclimb in 1948. By 1949 he was commentating on races alongside Max Robertson, although it wasn't until the late 1970s that each Formula 1 race was given extensive coverage on British television. He did occasional Formula 1 commentaries during the 1970s, going full-time for the 1978 season. He commentated on Formula 1 through to the 2001 United States Grand Prix at Indianapolis. His first regular work was on radio coverage of the Isle of Man TT, initially alongside his father. After Graham's death in 1962, Murray took over the lead role. He covered motocross (initially for ITV) during the 1960s and rallycross in the 1970s and early 1980s. He occasionally commentated on motorcycle racing and rallying. Murray also covered the BTCC for the BBC between 1988 and 1997, and the Macau event for Hong Kong TV on nine occasions. On Formula One coverage from 1980 to 1993, Murray struck up a surprisingly successful, and extremely popular, double act with 1976 World Champion James Hunt. Initially they did not get on, as Hunt's interests, personality and private life appeared to have little in common with Walker's. However, the pair eventually became good friends. Murray and James were to work together for more than a decade at the BBC, until Hunt's sudden death from a heart attack two days after the 1993 Canadian Grand Prix. When in the commentary booth together, Murray would provide his typically animated descriptions of the action, with Hunt bringing in his expert knowledge (which included inside information from the pits, typically from his former team McLaren), and often opinionated nature, in his co-commentary role. The pair didn't always get along in the commentary box though. Typically, they had to share one microphone which meant passing it back and forth to each other, with the usually sitting Hunt waving a hand (often unsuccessfully) in Murray's face when he wanted the microphone (Murray would often stand while doing race commentary, especially at the start of a race). On one occasion early in their partnership, Murray wouldn't hand the microphone over after repeated attempts by Hunt for him to do to. In frustration, Hunt stood and grabbed the microphone from him, which caused the normally cool Murray to grab the former World Champion by the collar and raise his fist to hit his partner, though cooler heads prevailed and they continued to form a successful partnership. After Hunt died, former F1 driver Jonathan Palmer joined Murray in the commentary box until the end of 1996, though in 1993 others such as 1980 World Champion Alan Jones took the role as Walker's partner for the "fly away" races in Japan and Australia at the end of the season. The following year, the television rights for the UK coverage transferred to ITV, and Murray followed. His co-commentator from the 1997 season onwards until his retirement from commentating was another F1 driver, Martin Brundle. There were few Grands Prix between 1978 and 1996 that Murray did not commentate on while employed by the BBC, usually as a result of him actually commentating elsewhere. Some of these included the 1979 Belgian Grand Prix and 1988 Hungarian Grand Prix (when Simon Taylor deputised for him), the German Grands Prix of 1981 and 1984 (both commentated on by Barrie Gill), and the 1985 German Grand Prix (Tony Jardine). 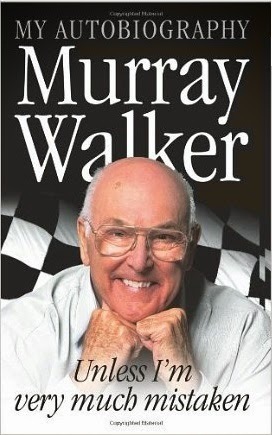 Murray also wrote a series of annuals for the Grand Prix season, Murray Walker's Grand Prix Year, for Hazelton Publishing from 1987 to 1997. The books, which have become something of a collectors item among enthusiasts, usually consisted of a summary of the season as well as each individual race, with Murray's own comments on the individual teams and drivers performances, as well as news about the teams. In December 2000, Murray announced he was to retire from Formula One commentating. Murray's final Formula One television commentary was the 2001 United States Grand Prix which was also the second F1 race held at the Indianapolis Motor Speedway, which, coincidentally, was the last race win for Mika Häkkinen. Upon his retirement, Murray was awarded an original brick from "The Brickyard" by track president Tony George, an honour very rarely bestowed on anyone other than the winning driver of a major race at the venue, such is his standing in the motor racing community. In November 1997, Murray was awarded an Honorary Doctorate of Letters Degree from Bournemouth University. He was later honoured, in July 2005, with an Honorary Doctorate from the Middlesex University, London. He was the subject of This Is Your Life in 1997 when he was surprised by Michael Aspel during a promotional video launch at the Sport’s Cafe in London’s Lower Regent Street. In October 2005, it was announced that Murray would be returning to the microphone as the BBC's voice of the new Grand Prix Masters series. After providing the commentary for the inaugural race in South Africa, in January 2006 BBC Radio 5 Live announced that Murray would be part of their team for their coverage of subsequent races. Years of exposure to loud engines and age-related hearing problems left Murray with hearing loss in both ears. In 2006 he became chief ambassador for David Ormerod Hearing Centres, the high street Audiology chain that fitted his hearing aids. In March 2006, the Honda Racing F1 Team, formerly British American Racing, announced that Murray would become its team ambassador for half of the 2006 season's 18 Grands Prix, starting with the San Marino Grand Prix in April. Murray welcomed Honda Racing's VIP guests and entertained them with his F1 commentary. In March 2006 Murray returned to the microphone for the Clipsal 500 V8 Supercar round in Adelaide, held on a modified version of the Adelaide Street Circuit used for the Formula One Australian Grand Prix from 1985 until 1995. Then in April he commentated on the Australian Grand Prix for Australia's Formula One broadcaster Network Ten, showing he had lost none of his legendary commentary voice. He was also Sky Sports' commentator for their coverage of Grand Prix Masters. In March 2007 Murray again returned to the microphone for the Clipsal 500 V8 Supercar round, and was awarded a Lifetime Infinite Pass to the event by organisers at a ceremony on pit straight, shortly before the main race. In March 2007 he was again part of Network Ten’s commentary team for the Australian Grand Prix. In June 2007 Murray visited the Isle of Man to celebrate the Centenary of the Isle of Man TT and work on a DVD documentary about the event, TT: Centenary Celebration with Murray Walker, which was released later in the year. In July 2007 Murray commentated on the European Grand Prix for BBC Radio 5 Live. This was a one-off in place of regular commentator David Croft who was on paternity leave. On 28 June 2008 Murray was honoured by the people of his hometown and presented with a "Star" on the Walk of Stars on Broad Street in Birmingham. In November 2008, Murray's presence in the BBC's recovered coverage of F1 - as a website columnist - was confirmed. Earlier that year, while being interviewed on BBC Radio 5 Live, Walker was asked if he'd consider a return to the TV commentary box. He answered, "Never say never". Now in his nineties, Murray still remains in the public eye and contributes to the sport that is synonymous to his name, although appearances and contributions are a lot less frequent. On 5 June 2011, a documentary entitled 'Life in the Fast Lane' premiered on BBC 2 that looked into his life, particularly his shaping of the sport we are accustomed to today. The programme itself featured him re-living his tank commander past and rides on classic scramble bikes. Memorable moments of his commentating career are also re-lived, and the documentary also accompanies Walker, aged 87, to Australia to experience the thrills he once faced at the opening race of the season. In May 2013, while on holiday, he had a fall, breaking his pelvis. During treatment for the fall, Murray was diagnosed with the early stages of lymphatic system cancer. 89-year-old Walker told the BBC "They've caught it incredibly early. It's treatable - the doctors say my condition is mild and I'm very hopeful." In June 2013, it was reported that Murray was to receive chemotherapy in the coming months and had cancelled plans to attend the 2013 British Grand Prix at Silverstone, however on 28 July 2013, Murray revealed that he no longer requires chemotherapy.